What makes this holiday different from all other holidays? Growing up in a Jewish home has given me wonderful memories of the Passover holidays we celebrated when I was a child. Weeks before Passover my mother would start liberating the Pesach tableware from the nooks and corners where they had been stashed since last year. The whole house had to be cleaned. When we were done, of course, not a crumb of chametz remained. And the cooking and baking! I can still close my eyes and imagine the wonderful aromas that emanated from my mother’s kitchen. Matzo meal cookies were my favorites. It was my job to stick a finger in the center of the cookie mixture and then fill the indentation with a bit of strawberry jam. Now my grand-daughter helps her mother make the cookies. The cast has changed but the play is the same. One generation passes customs and traditions on to the next. Music helps us to remember the past while celebrating the present. The JSA has compiled this special mix of holiday songs for you to enjoy. Many of this year’s tunes were on last year’s Passover Music Mix, but there are also a few new ones. These songs were selected from albums on the JSA website. They are for your listening pleasure only. They may not be copied, reproduced or sold. All of the songs in this music mix can be heard on the JSA website all year long. 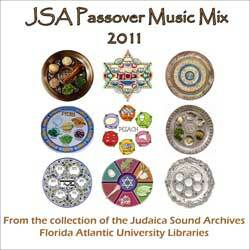 Selections from the following albums were used to create this 2011 Passover Music Mix. Celebrate with Cindy by Cindy Paley. Haggadah Songs by Chaim Parchi. Psalm Songs from Rock Creek by Cantor David Schneyer. Mostly Matzoh by Fran Avni. The Passover Collection by Safam. Passover Seder Service by Cantor Samuel Malavsky and the Family Choir. Passover Sing-a-long can be found in the Children’s Village record label collection. A Singing Seder by Cindy Paley. Seder by Cantor Moshe Koussevitzky. Songs My Bubbe Should Have Taught Me by Lori Cahan-Simon can be found in the JSA participating performers collection. Songs of the Haggadah by Cantor Benjamin Maissner. Canciones de Pesah/Passover Songs by Gaston Bogomolni can be found in the JSA participating performers collection.